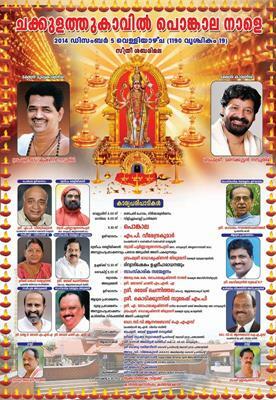 The annual Pongala featival of Chakkulathukavu Bhagavathy temple will be held on 5th December 2014. Over 5 lakh women devotee from Kerala, Karnataka, Tamil Nadu and other states would throng into the area to offer pongala. Prior to the festival day, devotees cleaned the roads and byroads in the area and have started making hearths along the roads. Pongala hearths will be extended to 70-km stretch from the temple to the roads connecting various places like Thakazhi, Tiruvalla, Kozhancheri, Chengannur, Pandalam, Kidangara, Podiyadi, Mannar, Mavelikkara and Harippad. As the rituals started at 4 AM with Ganapathihomam, nirmalyadarsanam and vilichucholli prarthana, temple chief priest and truest head karyadarsi Radhakrishnan Namboothiri will light the pongala hearth (Pandara Aduppu) at 9 am. The ceremonial lamp will be lighted by Poornamrithanandapuri, the general secretary of Mata Amrithanandamayi Trust. After the blessing of pongala by over 500 priests, the Uchcha deeparadhana will be held. Pongala festival is the phenomenally renowned festival held during the month of 'Vrischikam' when the the glory of the Goddess is at its peak. Rice, coconut and jaggery are brought by women devotees which are cooked in the round earthen pots. As chief priest lights the main hearth from the divine fire inside the sanctum sanctorum, the fire is exchanged from one over to another. During the time of lighting the main hearth an eagle is found to circle far above the sky which is believed to be an unfailing blessing of the Goddess. The sight of the bird brings an inexplicable feeling of elation over the devotes and they utter the divine names of the Goddess. It is believed that the Goddess herself showers blessings, while the grievances and problems of the devotees are washed away through the Pongala offering. The Pongala festival in the Chakkulathukavu temple is one of the foremost rituals being held. The Pongala meeting will be inaugurated by M P Veerendrakumar. The cultural meet in connection with the pongala being conducted in the evening at 6 PM will be inaugurated by Home Minister Ramesh Chennithala. Thomas Chandy MLA will preside over the function, while Kodikunnil Suresh MP, Seema Jagaran Manch all- India secretary A Gopalakrishnan, Guruvayur Devaswom Trust former administrator K Venugopal temple chief karyadarsi Radhakrihsnan Namboothiri will speak in the occasion. C V Anandabose, the UN Expert committee chairman will light the karthika deepasthambham. Around 1,000 volunteers will provide their service to the devotees.